Carryings On Up The Dale: SEVEN YEARS WAR: Bridgehead Breakout Tabletop Teaser after action report. 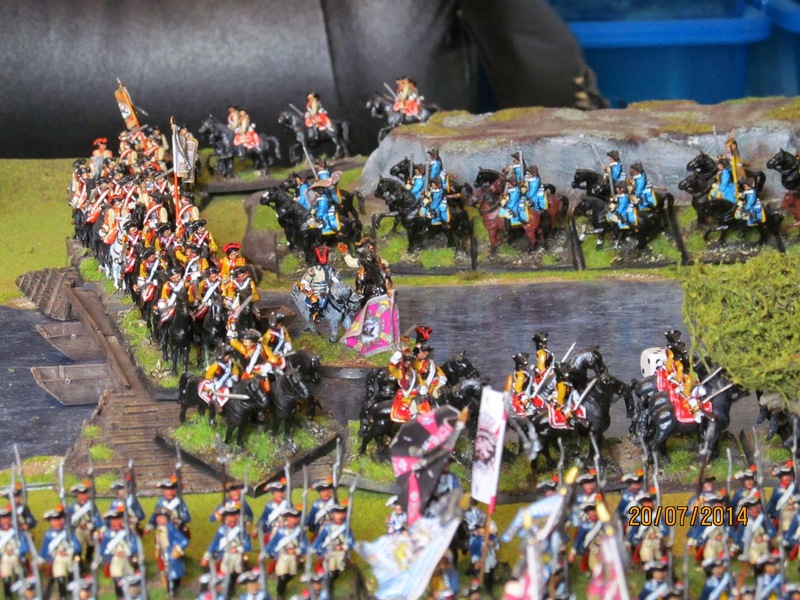 SEVEN YEARS WAR: Bridgehead Breakout Tabletop Teaser after action report. As planned Paul came up today (or yesterday by the time I post this) for our monthly game. As outlined in my last post we were going to try No 21 from Charles S Grant's Tabletop Teaser book. 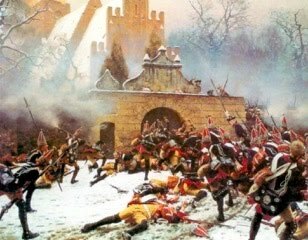 The objectives and forces involved are detailed in the earlier post but essentially the Prussians had established a small bridgehead across an impassable river facing a slightly smaller Russian force tasked with preventing them from getting enough troops over the river to force the Russians to retire. 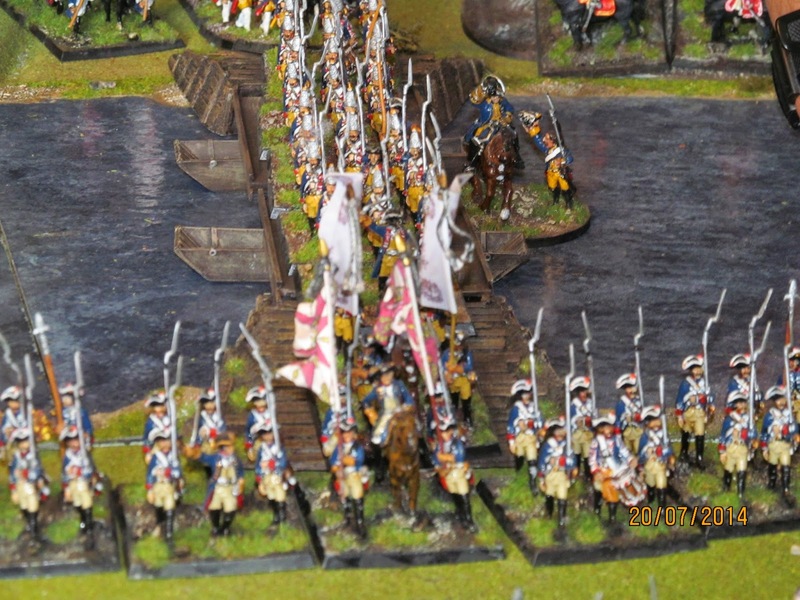 There were only two bridges across the very wide river so the Prussian's had quite a job on their hands to ensure that they would be able to reinforce the brigade already across the river before the Russians descended upon them. That was the theory at least. As noted last time, the command levels for all the generals were to be decided randomly. Randomly is not quite the correct term as the Prussian generals were historically much better than their Russian counterparts so they had a bit of an advantage when it came to chucking dice. 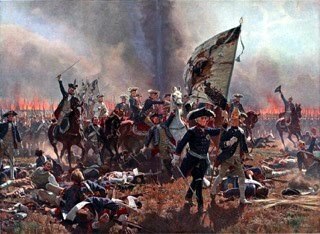 As it transpired, the Prussian heavy cavalry brigade commander was a 9 and the remainder of the Prussian commanders, including the CinC, were 8's. Pretty good given that much of the Prussian army were classed as 'reliable' with some as 'superbly drilled' so getting them to move wouldn't be too difficult. The Russians by comparison were rather pedestrian. I always have at least one 6 and one level 7 commanders in the Russian army, but in the game their line up was even worse than that! Two of their brigadiers ended up being classed as 'idiot commanders', rated 6, two others (including the CinC) were poor, rated 7, and the remaining two were rated 8. Paul got to play with the Prussians and I had the Russians. I wasn't phased too much by my poor commanders as I had a plan, based on what I thought the Prussians would do. Wrong! 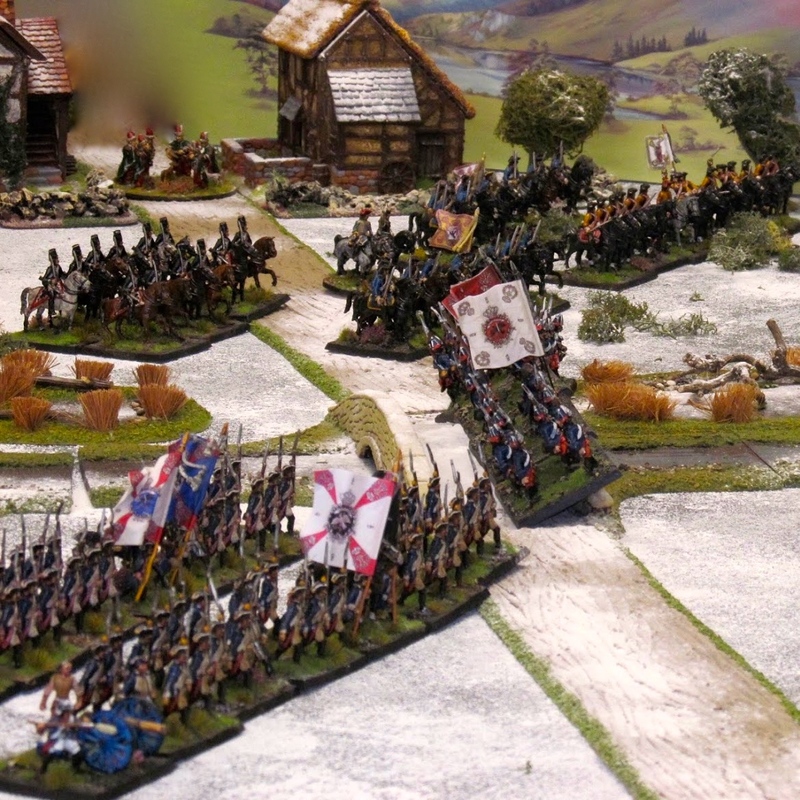 At the start of the game the Prussian advance guard advanced slightly to make room for the expected reinforcements and Hussars of HR5 von Reusch swept out onto their left flank, facing the Russian Serbski Hussars and a band of Cossacks. 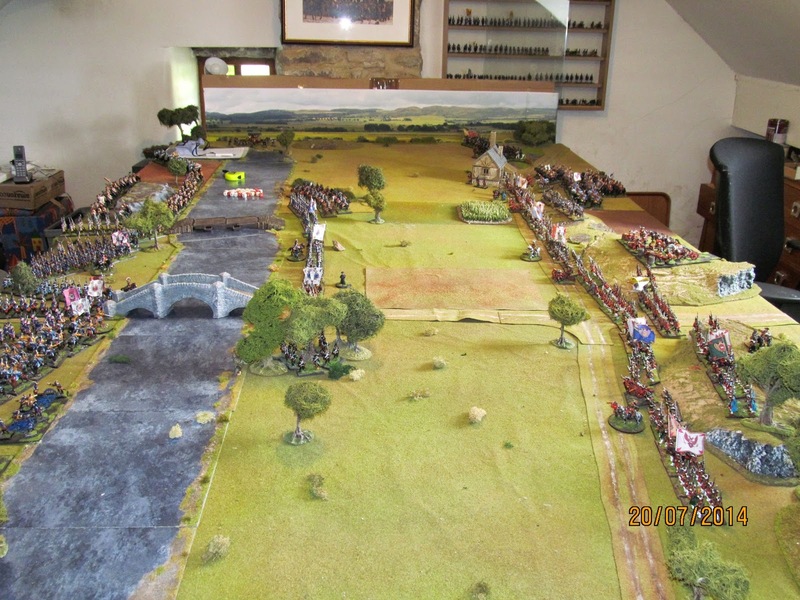 Paul then managed to throw some annoyingly low command dice and in the blink of an eye both bridges were full of Prussian infantry, with the lead elements already deploying into line on the Russian side of the river. I had planned to advance my entire line and try and crush the Prussians before they could establish themselves in sufficient strength to cause me any grief. Sadly, my nitwit generals failed all their command throws, with the exception of the Hussars out on the right wing. 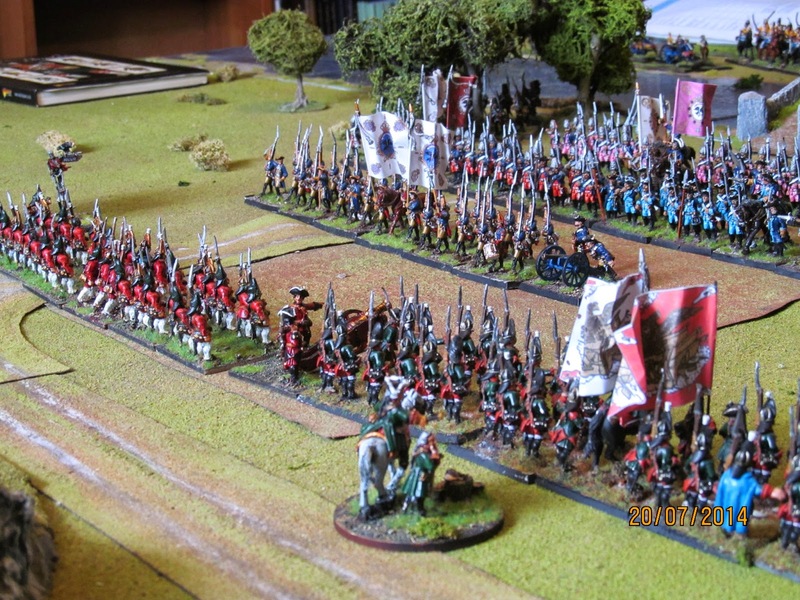 They successfully charged the Prussian Hussars but, unsupported as the Cossacks had failed to move up with them, the melee was inconclusive and both sides had to withdraw, both somewhat battered. Meanwhile, the Prussians were advancing into my 'trap' in the centre (ha! 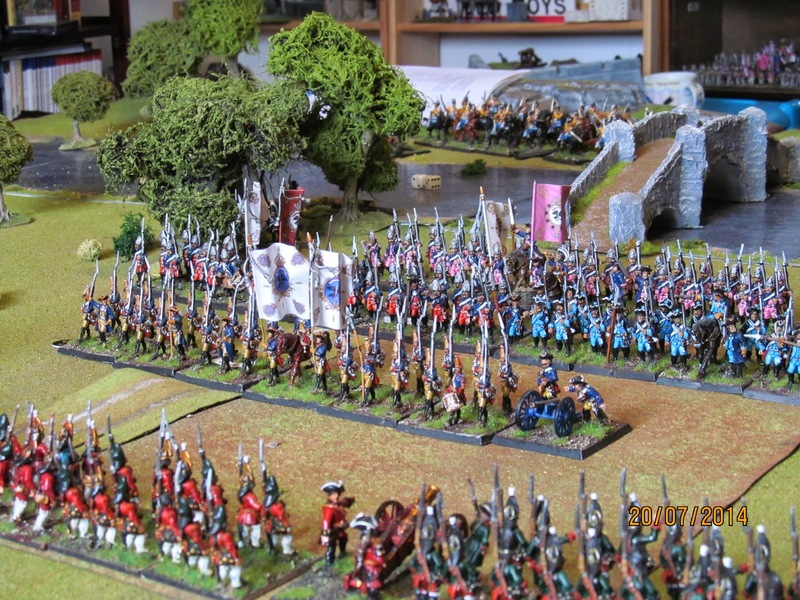 not really); well they were advancing and after more troops had deployed over the river Paul moved them up into close range and let rip with a volley or two. 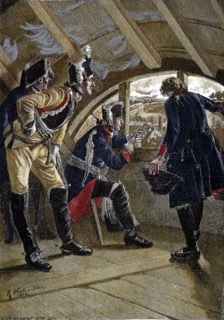 The three lead Prussian battalions were IR13 Itzenplitz, IR 19 Markgraf Karl and the Guard Grenadiers of IR 6. I allow the Prussians the advantage of platoon fire so with the extra D6 for first fire they had 5D6 in their first volley. The Russians on the other hand were not so good at shooting but were very good at soaking up damage. I don't allow them first fire or platoon firing so they were at an immediate disadvantage, but being classed as 'Valiant' and/or 'Stubborn' they were able to stand up to the Prussians, for a while at least. One battalion of the 1st Grenadier regiment was shaken and forced to retire and a battalion of the Moskovski regiment was broken. 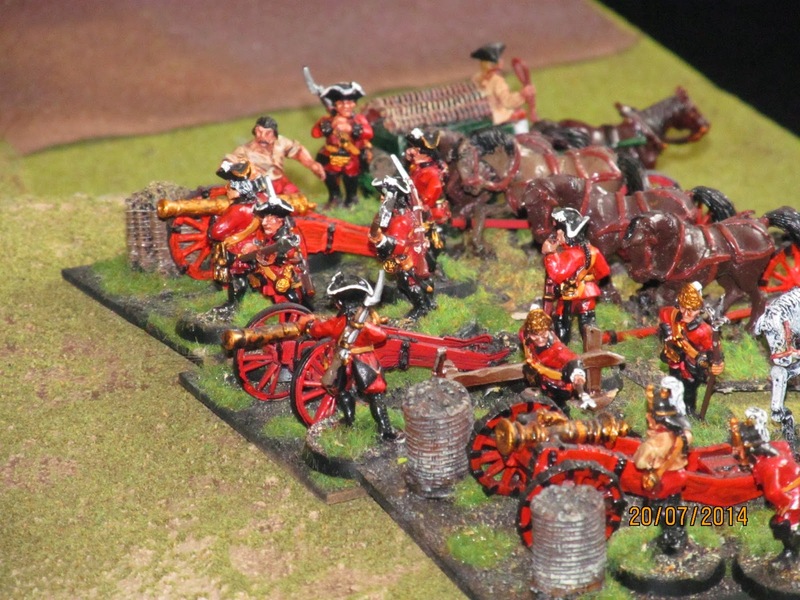 They were replaced in the line by a combined Grenadier battalion and regiment of dismounted Dragoons. The Prussians took some damage and were also hit quite hard by the Russian artillery. IR 19 was broken. After holding the Russians at bay for several moves, all the while soaking up a tremendous amount of fire, the gallant Grenadiers of IR6 finally broke. This meant that the remaining battalion from that brigade, IR13, had to withdraw. On the Russian left the brigade positioned there steadfastly refused to advance, thus loosing the opportunity to flank the main Prussian line. 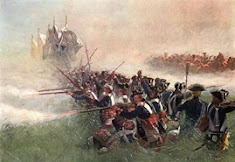 We reckoned that they were too scared of advancing into range of the Prussian artillery positioned over the river. 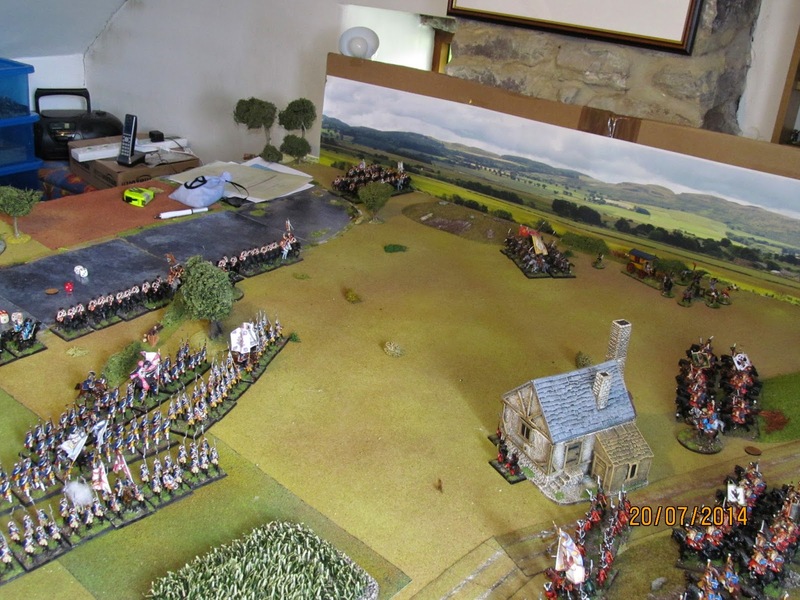 While all this was going on, the rest of the Prussian infantry had crossed the river and deployed facing the Russian centre. 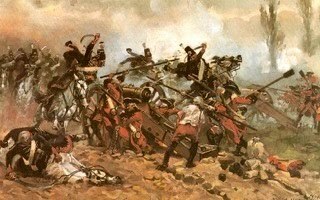 The Grenadiers of III/15 covered the Prussian left while the remaining three battalions of that brigade advanced to fill the gap left by the spent advance guard brigade. 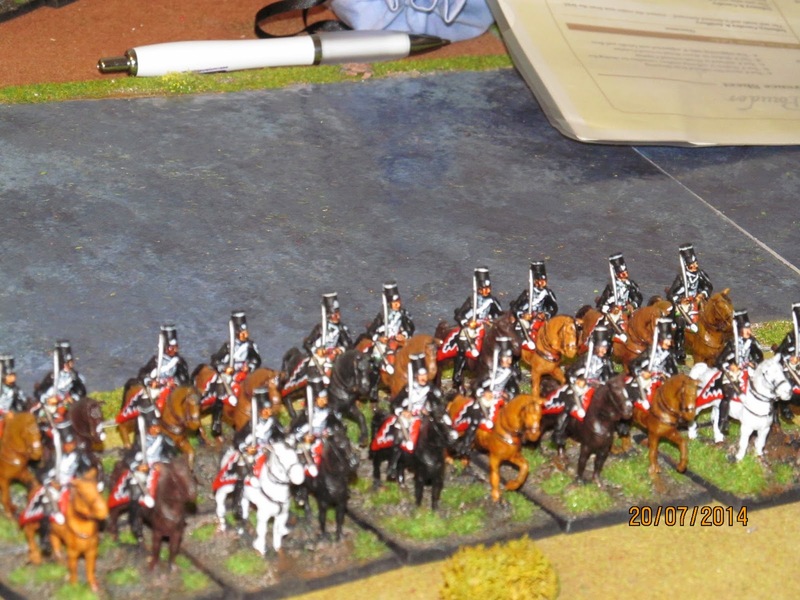 The Prussian heavy cavalry was also across the river and deploying on the Prussian left. 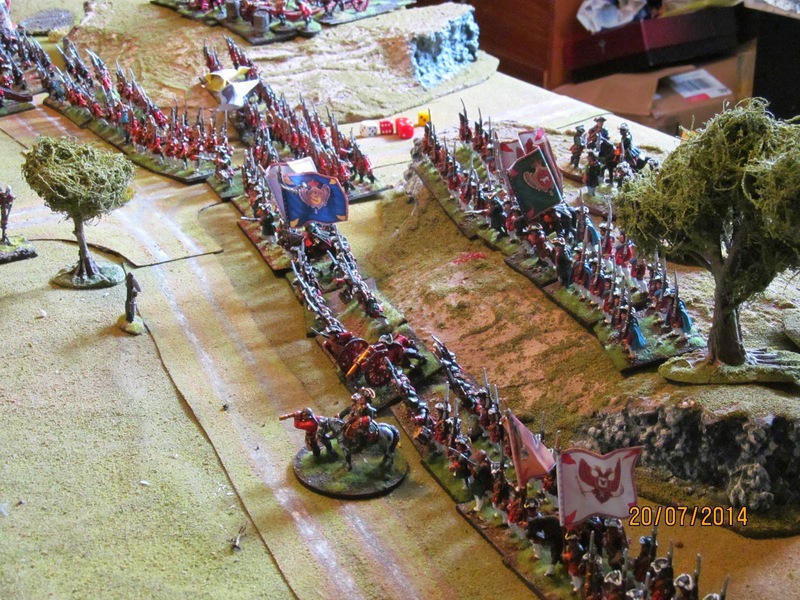 In a series of fierce charge and counter charges my Hussars were driven back and retreated off the table shaken. 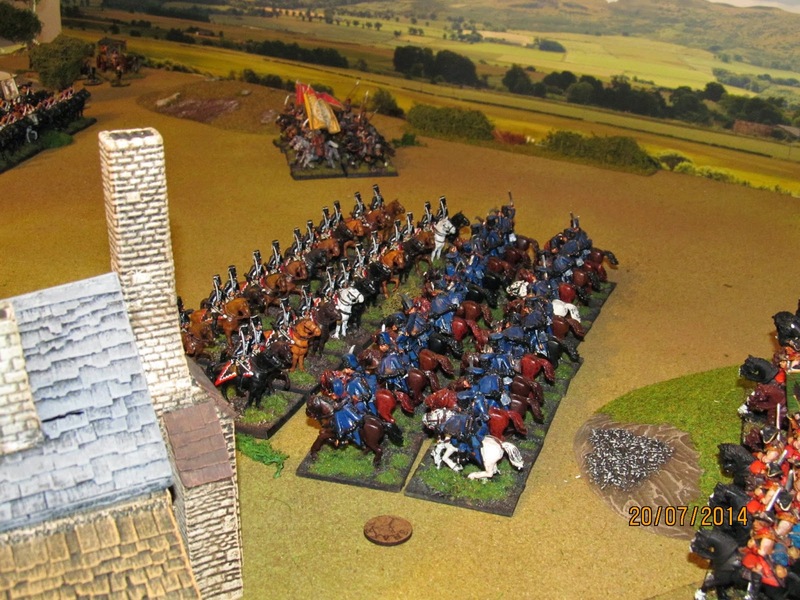 My cavalry brigadier ordered a 'follow me' command to the Lifeguard Cuirassiers and crunched into the Prussian von Ruesch Hussars who were predictably destroyed. 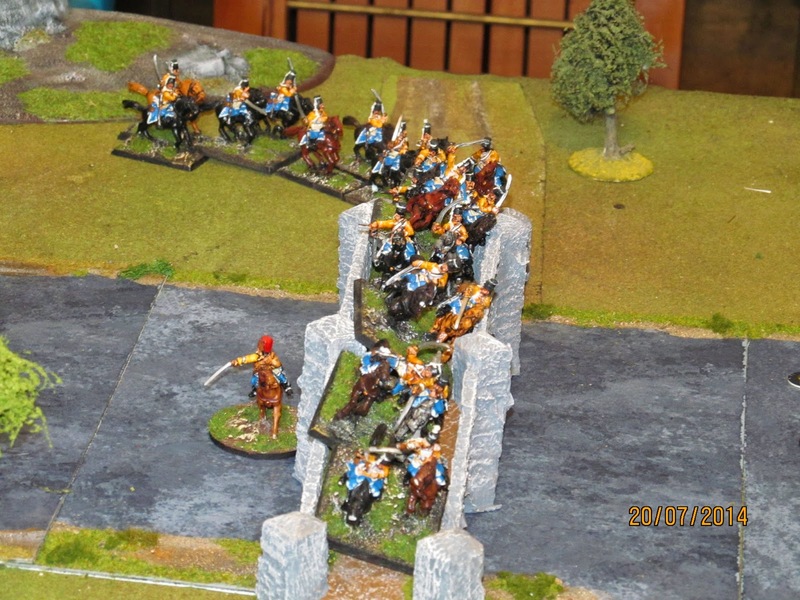 One of the supporting regiments of Cuirassiers had to withdraw but so did my shaken Cuirassiers. 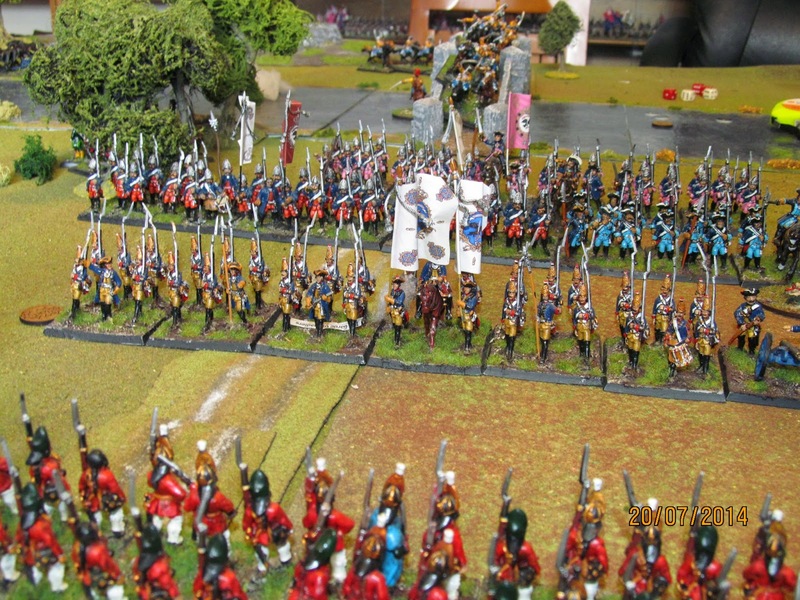 My other cuirassier regiment (Prince Fedorovich) charged the front of IR18 Prinz von Preussen and after surviving the closing fire crashed home and thanks to some great dice throwing from me and some dreadful saves from Paul the infantry were scattered. 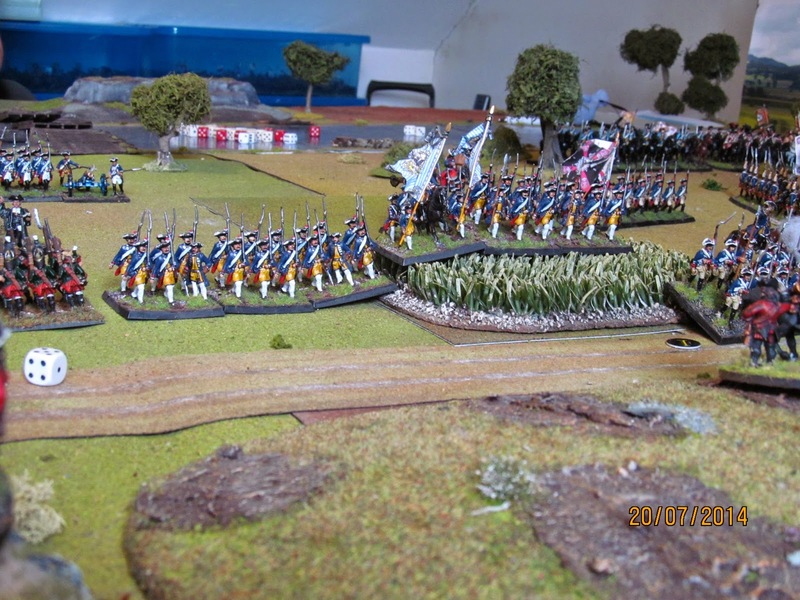 My Cuirassiers followed up with a sweeping advance into the flank of the Guard Grenadiers of III/15 but although the Grenadiers were shaken, so were my Cuirassiers. 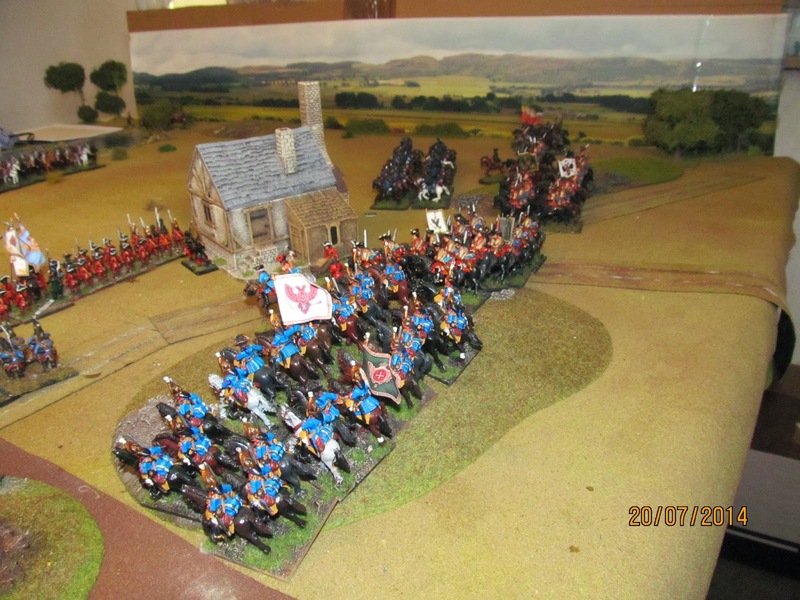 The Grenadiers just shrugged off the attack, so I withdrew my shaken cavalry while I had the chance. Once recovered the heroic Grenadiers assaulted the village from where Russian Pandours had been taking annoying (i.e. from my perspective wholly ineffective!) potshots at anyone who came in range. No surprise but the Grenadiers drove the Pandours out easily. Back in the centre, the Prussians were starting to suffer, especially at the hands of the Russian heavy artillery on the hill. The Frei Battalion von Mayr and then the orange-faced and underwear-clad fusiliers of IR49 Sers were broken, forcing my favourite unit (nothing to do with their pink facings and small clothes) IR 40 von Kraytzen to withdraw. 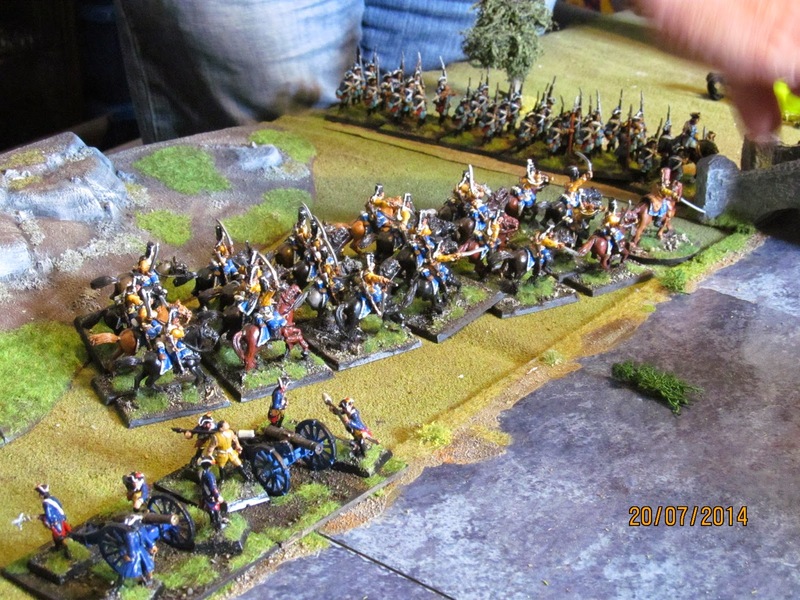 The Russian left-hand brigade finally moved forward and helped in the driving the Prussians back, despite offering a tempting target for the Prussian artillery who finally after waiting for the Russians to get in range, got to fire their cannon at the enemy! Paul tried to get his Hussars of HR7 Malachowski out of the bridgehead and onto the Russian flank but there wasn't enough space so they had to pull back. The Croats of von Kleist's Freikorps had been hiding in the wood for the entire battle and stayed there right to the end, trading a few shots with the Russian infantry line, but to no effect. brigade, the Apcheronski regiment, had to retire. The result was a massive gap. All I could do was try and plug it with what was left of my heavy cavalry. 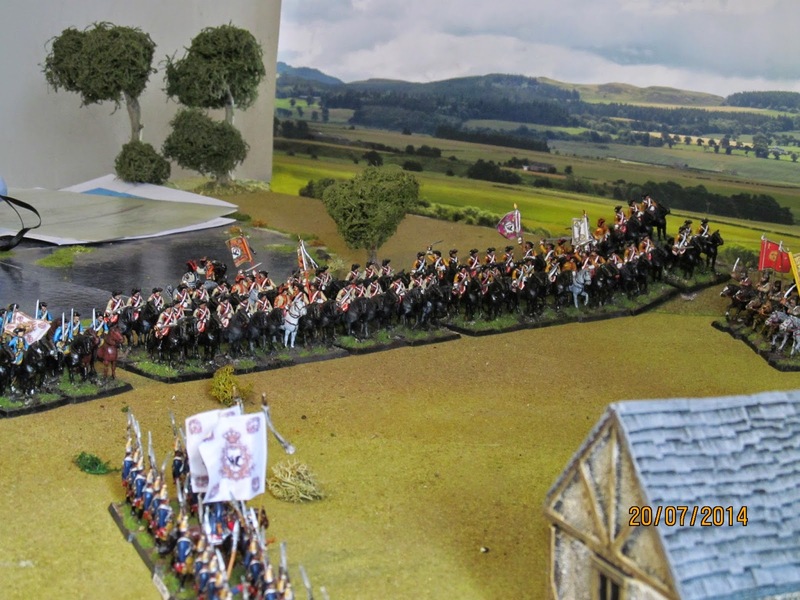 The Kargopolski Horse Grenadiers charged the Prussian line but this time the effects of the closing fire and subsequent melee was enough to break them. My already shaken Lifeguard Cuirassier regiment were destroyed by Prussian 12th von Kayau Cuirassiers who then followed up their victory by hitting the retiring Apcheronksi regiment in the flank. They too not surprisingly were ridden over and destroyed. 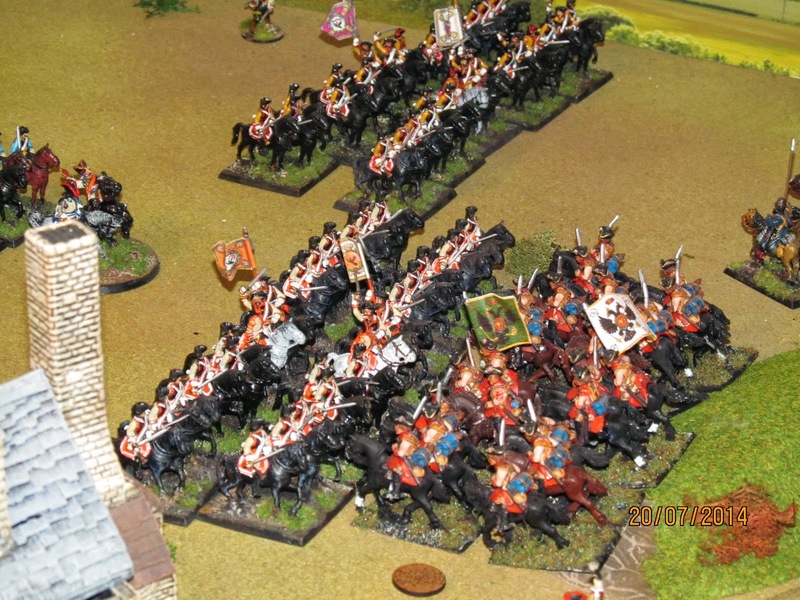 With two out of three of its regiments destroyed my heavy cavalry brigade was deemed spent, the surviving regiment, the Prince Fedorovich Cuirassiers, having to retire. 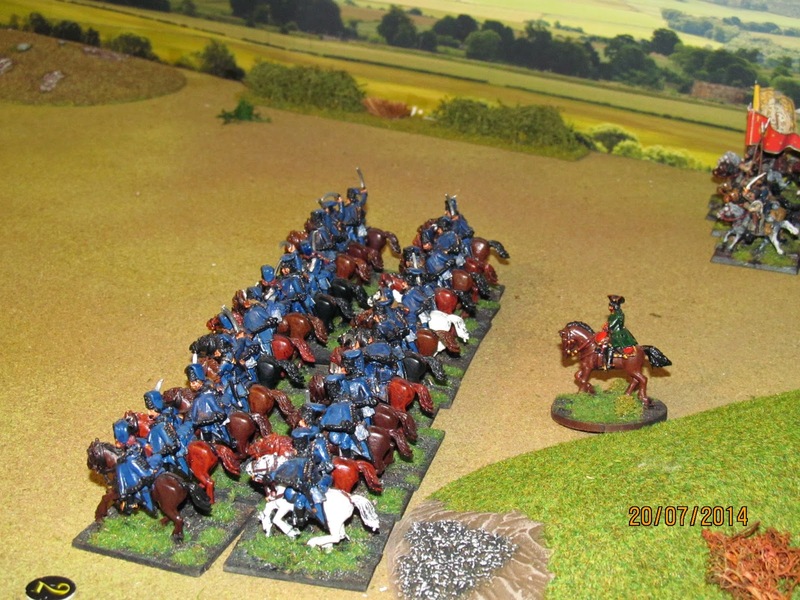 Meanwhile, the Cossacks had been driven from the field by the Prinz von Preusen Cuirassier regiment. As a result I had lost over half of my brigades so under the rules I had lost the game. I had lost the game by any interpretation anyway as the Prussians were in a perfect position to roll me up from the flank. 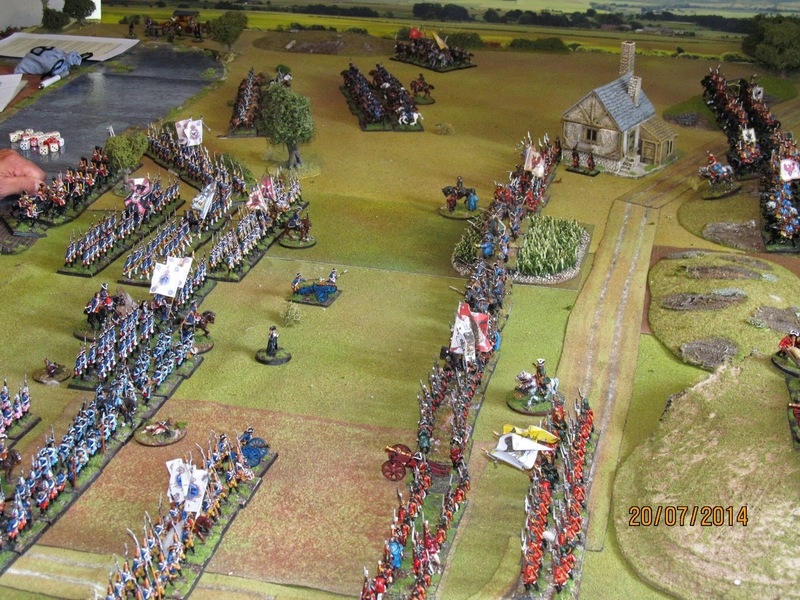 My artillery battery was in danger of being overrun by Cuirassiers, I had no cavalry left, and although the Prussians on my left and in the centre had been driven off, those on my right were hardly touched and in a position to give me a good old-fashioned stomping! A hard won Prussian victory was agreed. 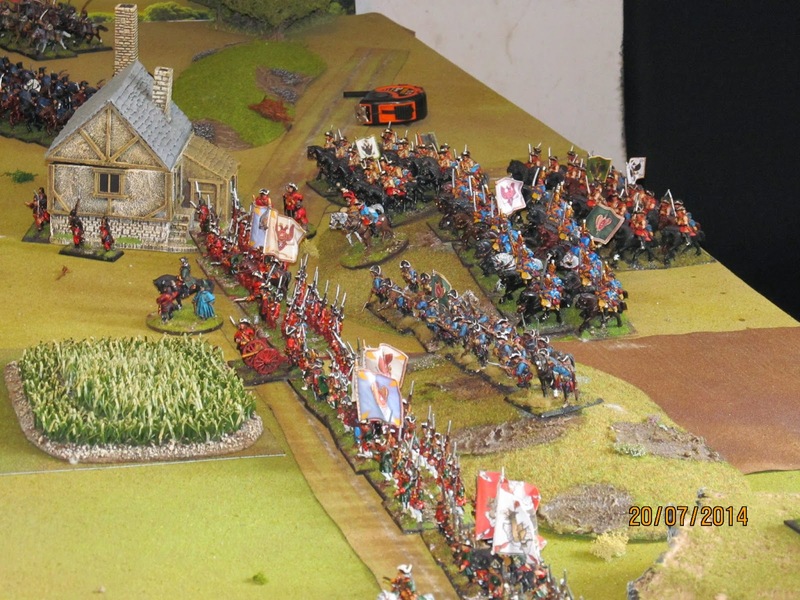 Actually, had the Prussians lost their surviving Hussar regiment, and therefore their third brigade, before I lost the Cossacks in my third brigade then the tables would have been turned so it was actually a very close game indeed. This teaser again provided a great challenge for both sides and a very enjoyable game it was too. Its interesting to think that even though the scenario was written maybe thirty-odd (or thereabouts!) 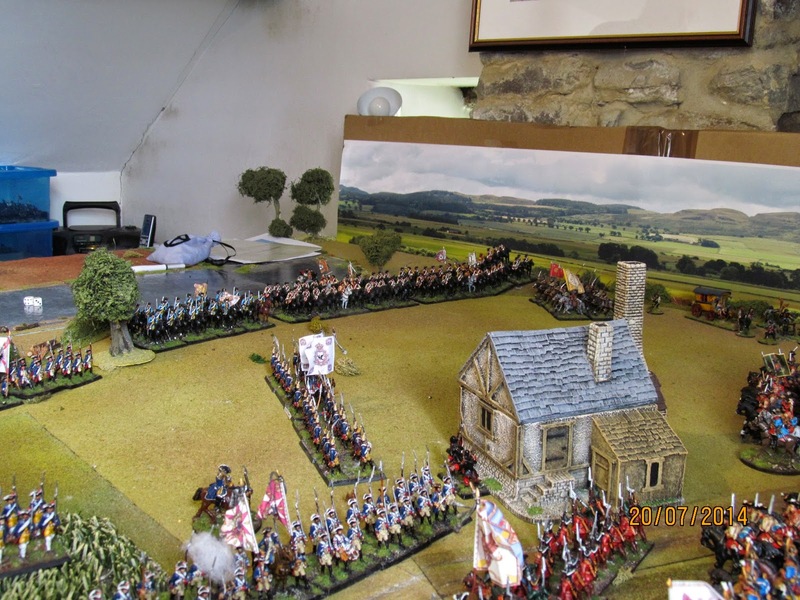 years ago, it has survived the test of time and makes for a cracking game using 21st C rules such as Black Powder. And if there's one thing to say about the rules, like 'em or hate 'em, this was a big game with lots of toys on the table, and we played in a very civilised way between about 10:45 and 15:30 including a lunch break and numerous cups of tea and illegal chocolate cookies, and got a result without feeling rushed in any way. And my back, so far at least, appears to have survived the experience! Next week its back to the Crimea. Lovely looking game and interesting report too! A very impressive looking setup. Your background panorama blends well and sets the whole thing off nicely.